"The First of February on Mt. Josephine"
I spent most of today snowshoeing the Mt. Josephine ridge line, which is one of my favorite things to do in the winter. 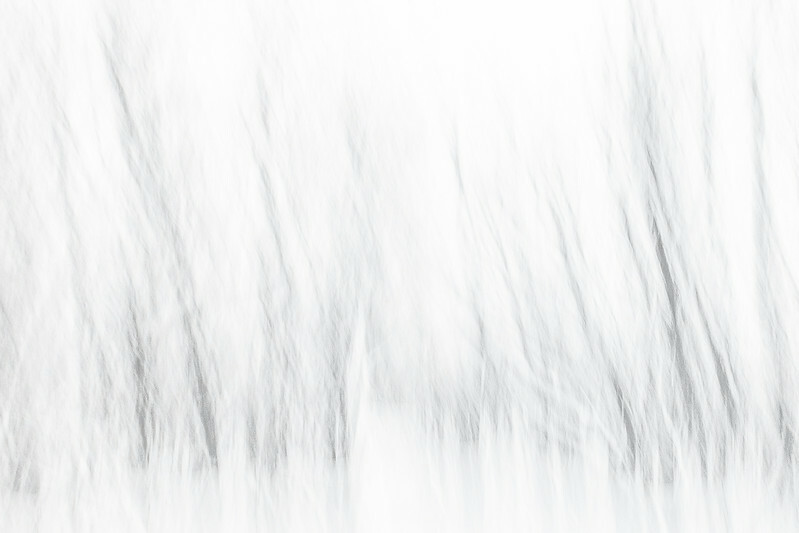 I find it more enjoyable in the winter because with no leaves on the trees, you can see the lake a lot more frequently than you can in the summer. 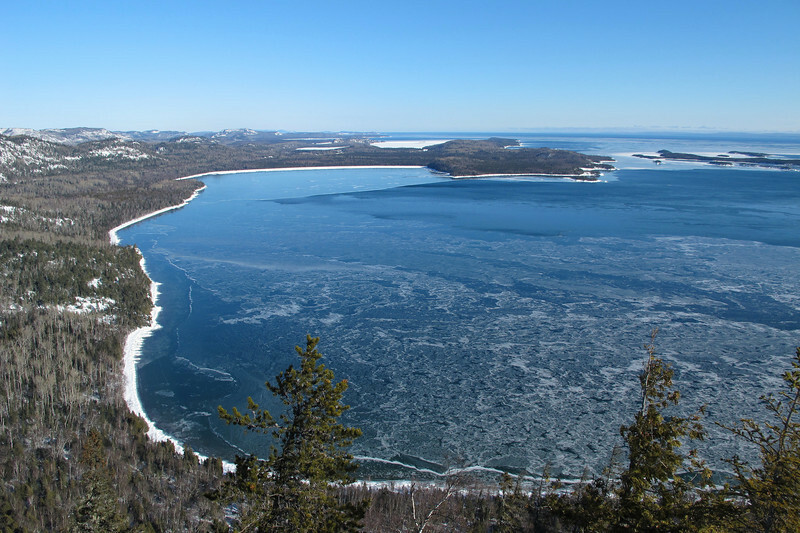 This image shows the view from the summit of the mountain, 700 feet above Lake Superior. This is the view looking Northeast towards Canada. 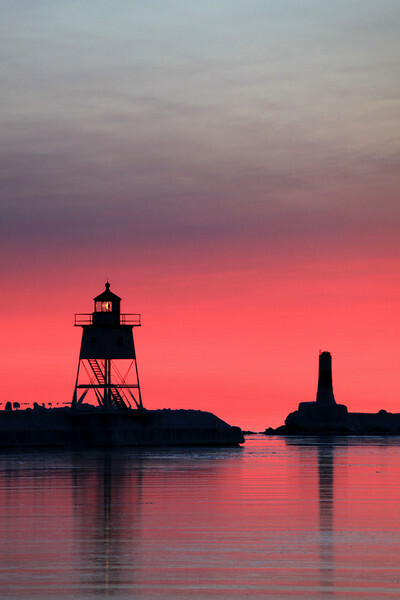 "Pink Sunset, Grand Marais Harbor"
After my snowshoe hike I took a drive to Grand Marais for some Sven and Ole's Pizza and was treated to this beautiful sunset over the harbor. "Winter sun rays over the Susie Islands"
I made this image on my way to work a few days ago. 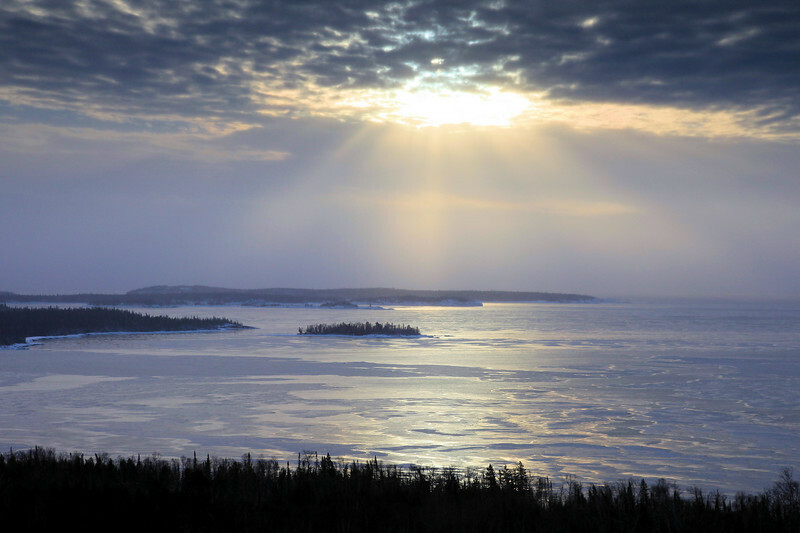 This view is from a highway overlook that looks down on Wauswaugoning Bay and the Susie Islands. I'm very lucky to be able to drive past this view on my way to and from work each day! It has provided for a spectacular photo opportunity more times than I can remember! "Ice Cave at Hollow Rock"
This "window" of ice is looking out on the little island known as "Hollow Rock", which has been the subject of more than a few of my previous blog entries. I feel very fortunate that I now have this image in my portfolio, since the decision to head out and shoot that morning could have easily gone the other way. We had spent 5 hours snowshoeing the previous day over some very rugged terrain, and our bodies really didn't feel like going out early in the morning and shooting again so soon after the snowshoe workout. The decision was made to head out, however, and boy am I glad that we did as several good images were made on this morning. The sunrise over Hollow Rock was very nice, with some interesting clouds to spice things up. 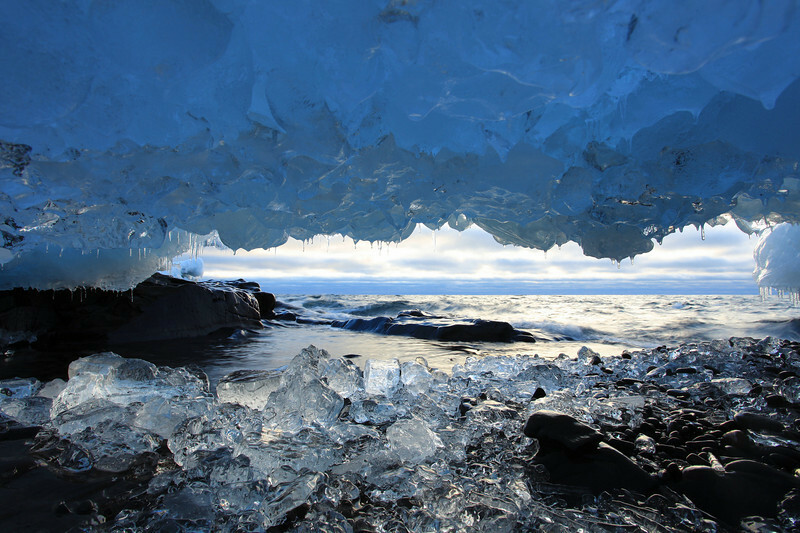 The real treat, though, was finding two small ice caves to photograph. This particular image is of the second ice cave that I found, and when I stuck my head into this little cave I couldn't believe the view I found with Hollow Rock visible through the hole. It was as though mother nature had tailor-made this ice formation for a curious photographer to stumble upon. There wasn't much room to work inside the cave to get this image. It required crawling into the cave head-first on my stomach then propping my elbows on the rocky ground to brace the camera for this shot. There was no room at this angle to use my tripod. 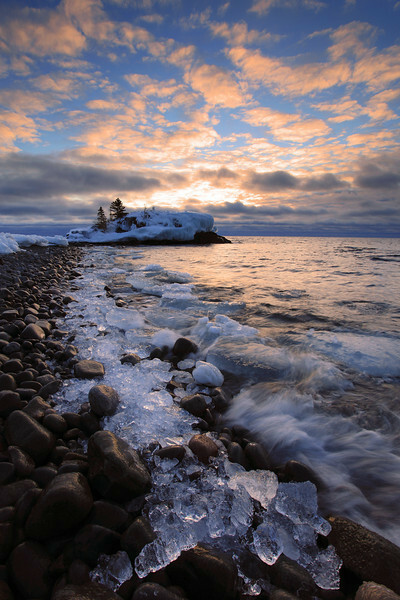 This is another image from yesterday morning's amazing time spent photographing the Lake Superior shoreline at Hollow Rock Resort in Grand Portage, MN. There were a couple of small ice caves in the area which were very beautiful but difficult to photograph because of their location and their small size. To get this image I had to crawl down along the rocks, lay on my side on the rocks and configure my tripod so it was as low to the ground as possible, then look sideways through the viewfinder to compose the image (remember, I was laying on my side to compose this image!). The distance from the ground to the top of this little ice cave was two feet at the very most. It was probably more likely about a foot and a half tall. I was only on the edge of the cave, I didn't want to risk crawling into it in case it chose that moment to collapse. The result was worth the effort! This was taken shortly after sunset today, just after the vibrant colors of sunset began to fade. This sunset easily ranks (in my book) as the most spectacular sunset so far this winter. The colors and clouds were incredible, a wonder to behold. As a photographer I am always desiring clouds like those in this image, that fan out from where the sun dipped below the horizon. Clouds like this don't seem to happen very often, but when they do it's a magical sight. 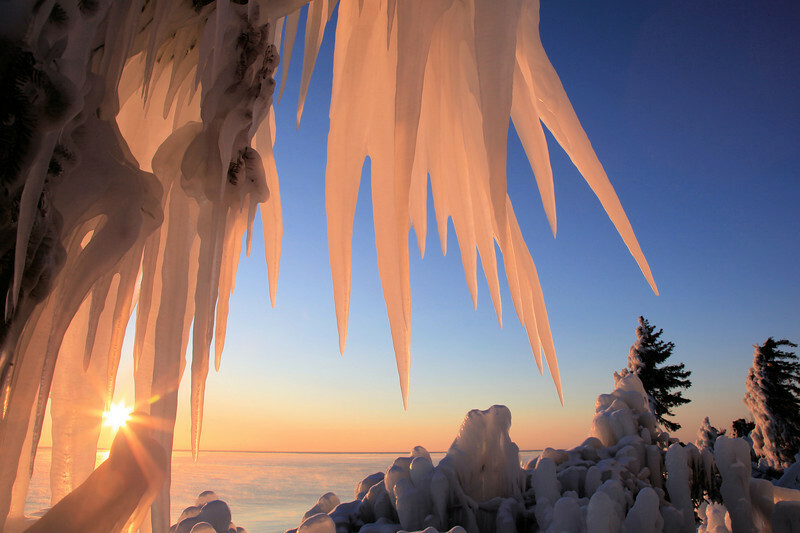 "Ice Crystal Sunrise at Hollow Rock"
A recent sunrise image from Hollow Rock in Grand Portage, MN. The next several days are calling for temperatures in the mid to upper 30's... hopefully all this wonderful ice we've had along the shoreline lately won't fall prey to the warm temperatures! 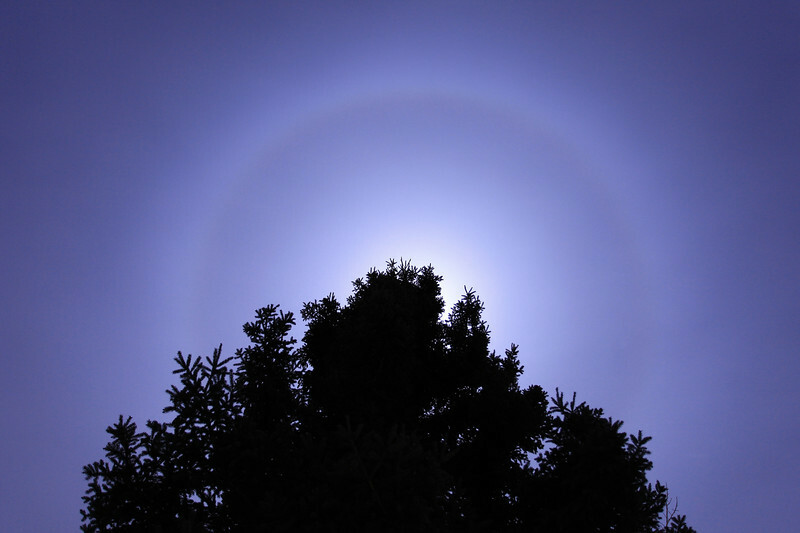 There's a fantastic ring around the moon right now! 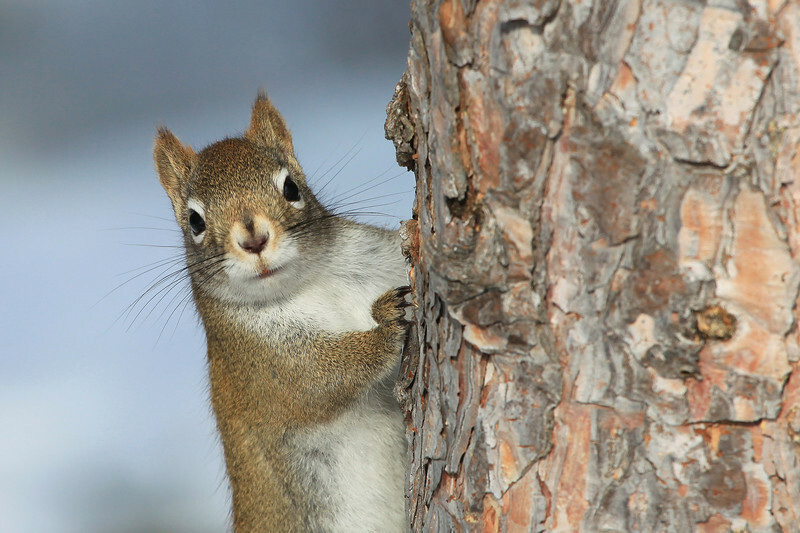 Taken from my back yard at 10:30 p.m.
A very curious squirrel checking me out with an intense look as I made this photograph of him. 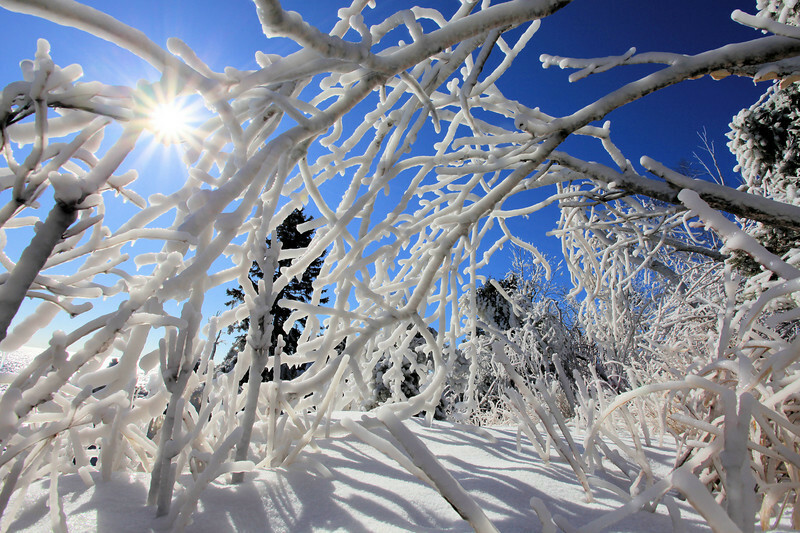 Ice-encrusted trees bend over and touch the ground, unable to bear the weight of ice that has accumulated from the freezing spray of Lake Superior. 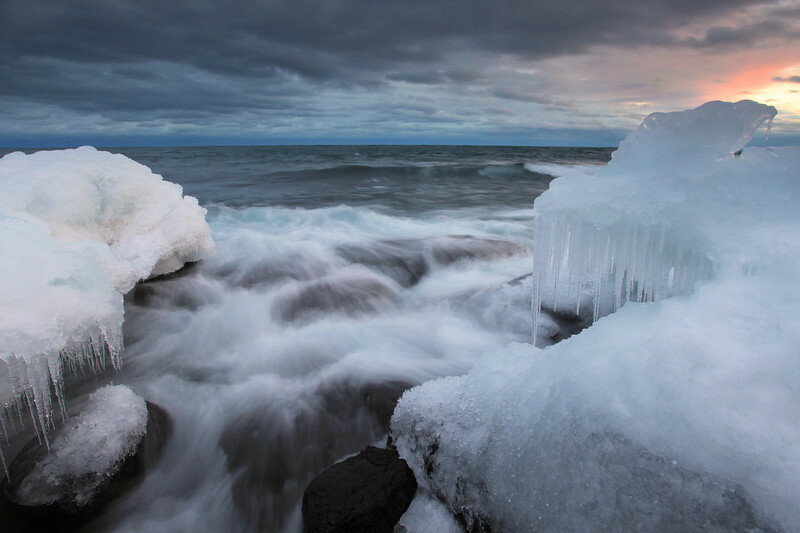 Taken at Tettegouche State Park near Silver Bay, MN. After a couple of failed attempts at capturing nice early morning light on the ice at Tettegouche State Park (due to cloudy skies), I finally had success this morning. I had to leave the house just before 5:00 AM in order to make it here for sunrise, but it sure was worth it. The other day when I drove down to try and capture this scene, the sky was clear when I left home. By the time I arrived at Tettegouche, however, the clouds had moved in and covered the entire sky, effectively ruining sunrise. So.... this morning as I drove towards Tettegouche, I was a bit tense thinking I was going to run into a cloudy sky again. But, luck was on my side and the clouds stayed away. Once the sun broke above the horizon and started to illuminate the ice, I was awestruck by the beauty. 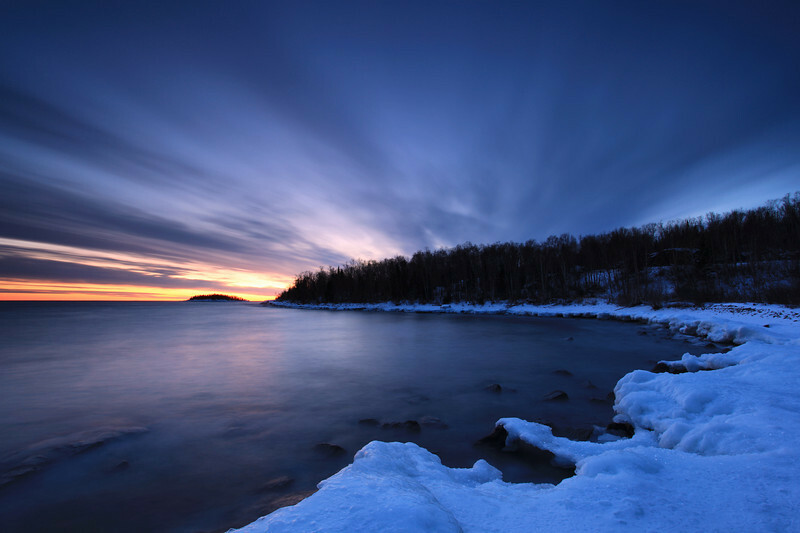 "Sunrise in the Frozen Forest"
This photo was made at Tettegouche State Park in Northeast Minnesota on the shores of Lake Superior. 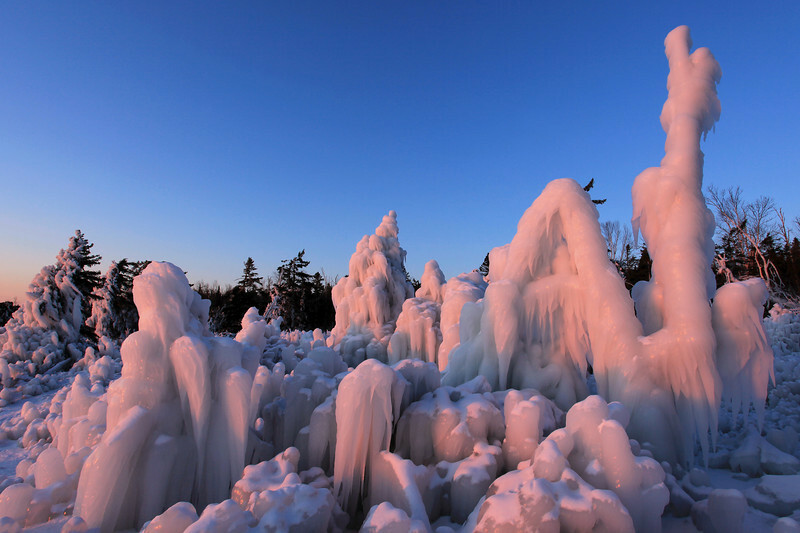 Parts of the shoreline at Tettegouche are a wonderland of ice right now. 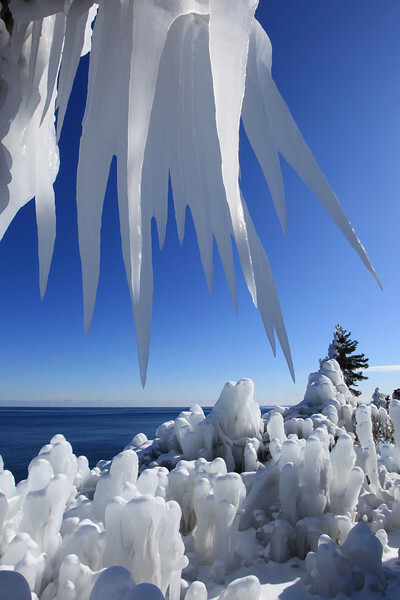 Thanks to high winds and waves that hit the shoreline just over a week ago, the trees at Tettegouche are covered in ice. Some of the cliffs at the park angle back as they drop down towards the lake, so when the waves come in just right they literally EXPLODE back out from the cliff and if the wind is strong enough it will catch the spray and fling it up over the cliff and into the trees. This only happens once in a great while, maybe only once or twice every 10 years (or so I'm told). 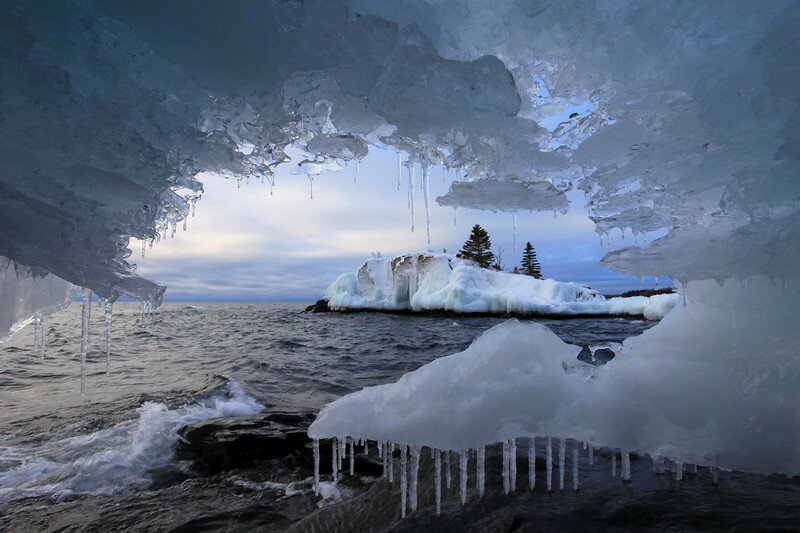 I've shared this ice experience with a few different friends of mine, and no matter how long you've lived along the shores of Lake Superior, this incredible ice makes you stare in amazement. Truly one of the most magnificent things I've ever seen in my life on the lake. Here is another photo of the same ice formation, taken later in the day after the sun had risen high into the sky.